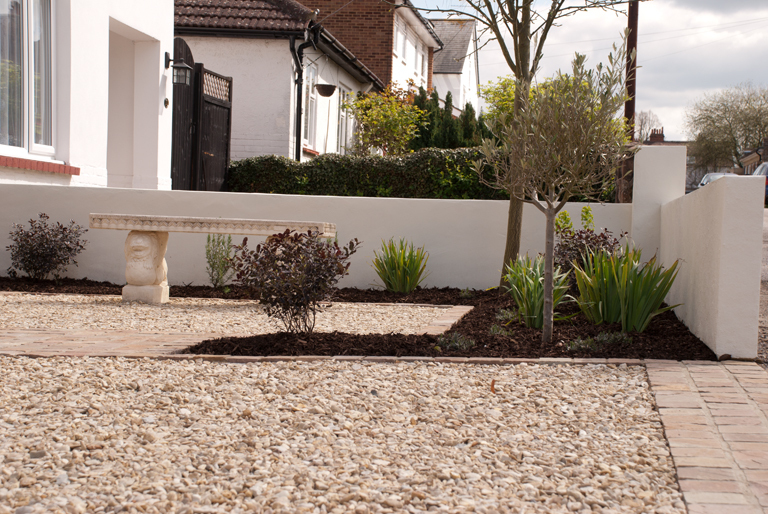 From the drawing board: My own front garden – finished! 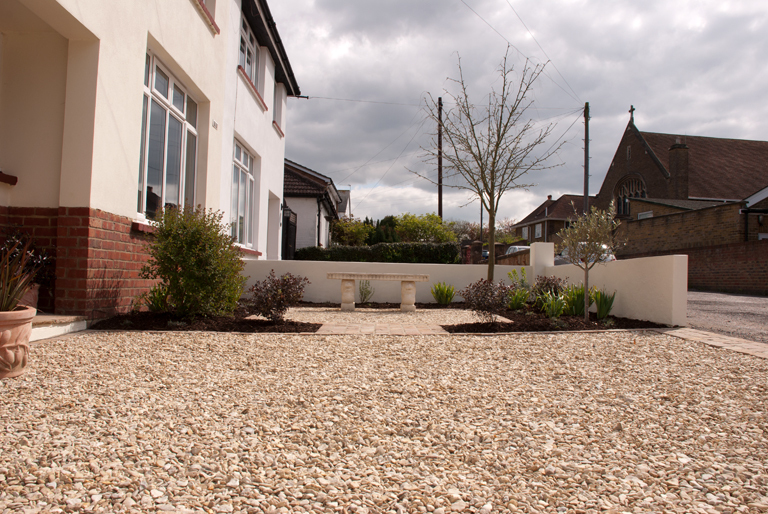 I hope you’ve enjoyed following the construction of my front garden – we planted yesterday and I can now share the pictures of the finished garden. I keep forgetting it’s done actually so every time I walk outside the front door it makes me smile! Gardens have the power to do that you see,they really do change the way you feel about your home. If you read my last blog post you’ll have noticed the big difference, but painting the rendered walls really did bring the garden to life. 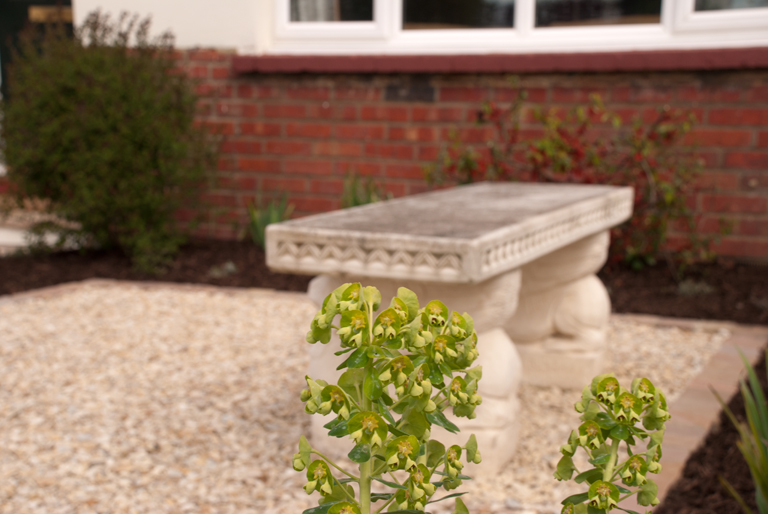 The garden has a real mediterranean feel to it now and certainly the plants need to be able to tolerate the heat of the summer – the front of the house faces south so when the sun does make an appearance it gets really hot out there. The neighbours can’t believe how much bigger the garden looks. This is purely because it has more structure now – you’ll notice that the driveway edge lines up with the porch and where the small square, where the bench is located, is the same width as the window. This not only gives the garden balance but it also connects it to the house. We decided to paint the walls ourselves and did this over the Easter weekend along with preparing the beds for planting. We have had a problem with bindweed in the front garden for years so we are hoping that our efforts to get rid of it have been successful this time. We have kept the planting really simple. The dwarf lilac and flowering quince were already happy there so I decided to incorporate them into the planting scheme. We have planted Lavandula angustifolia ‘Hidcote’, Pittosporum tenuifolium ‘Tom Thumb’, Sisyrinchium striatum, Rosmarinus ‘Miss Jessop’s Upright’ and Euphorbia characias subs. wulfenii. The Olive tree in the corner introduces some height and structure at the entrance. The last job of the day yesterday was to mulch the beds and fortunately it’s been quite wet over the past week. 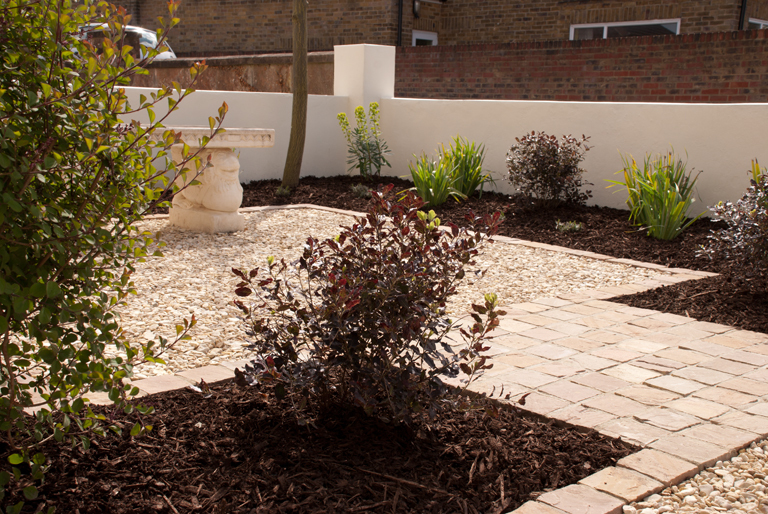 The soil is still relatively cool so the mulch will really help to retain moisture in the soil and keep the weeds away. Like many areas, we have a hosepipe ban in force so any watering from hereon in will need to be with a watering can! 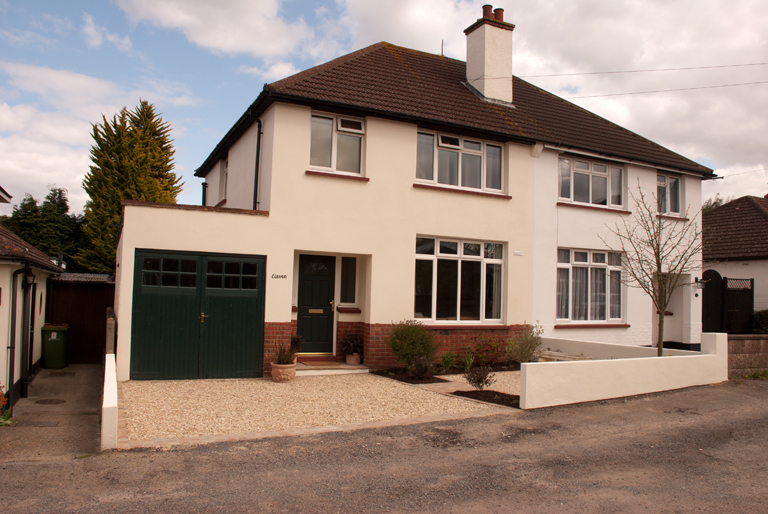 I hope you’ll agree that the front of the house looks lovely now – it’s a pleasure to look at now and it definitely makes me smile when I come home! 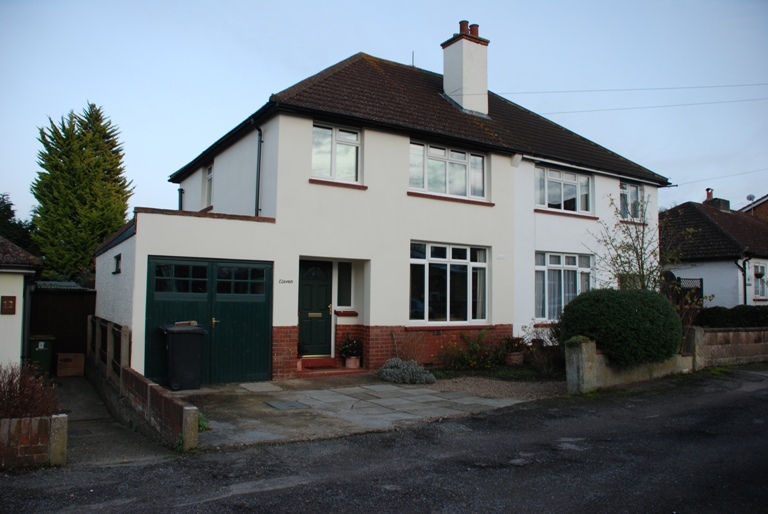 Wish it was….I’m in Leatherhead in Surrey! Amazing front garden! It looks fantastic, and I love the way you have lined up the proportions with the lines of the house. It would be great if you could publish a photo of how the planting looks 10 months on. And what did you do with the bins?! Thanks David – still makes me smile when I walk up to the front door. Bins are kept in the garage as we didn’t have the budget for a bespoke bin store (space a bit tight too). I’ll share some more photos soon – lavender grew like the clappers, despite the lack of sunshine! Fabulous! Looking for inspiration and found this. How is the Horcott gravel laid, Lisa? Is it resin-bound? Does it need specialist skills to do? Or is it just a question of getting the right gravel and the bashing machine?! It’s just laid over a soft granular sub-base (MOT Type 1). We used a whacker plate initially, but it’s a very stable gravel so other than a rake over every now and again it doesn’t need much maintenance. 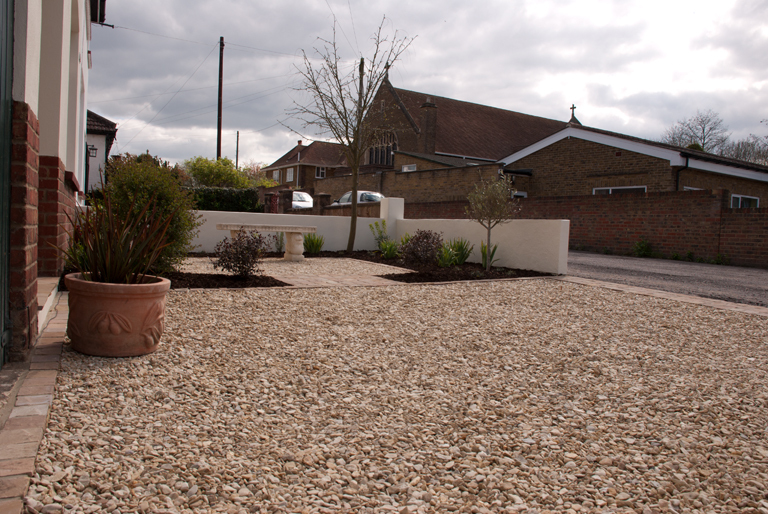 A similar aggregate is Buff Flint 20mm supplied by CED Stone Group.